This summer we were privileged to have Joel and Krista , missionaries in Costa Rica at the Spanish Language Institute, come to our home and share with a small group of us (pictured). Joel and Krista are supported from donors that give to Grace Missions International out of Bartlesville, OK and are not paid by SLI. 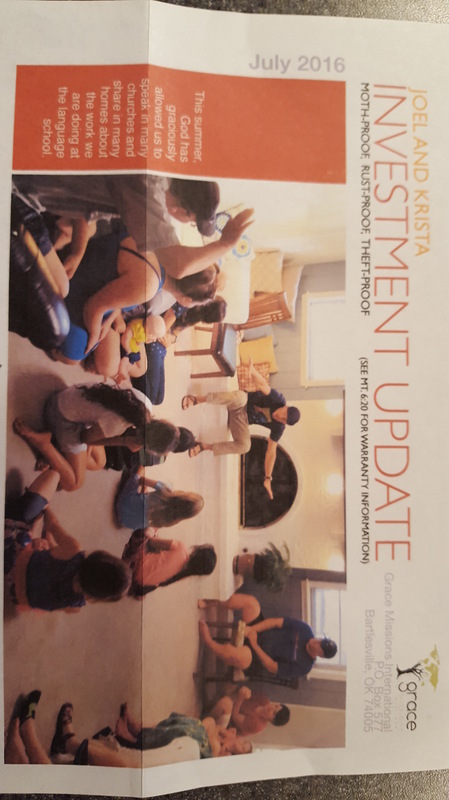 We recently received their newsletter and I wanted to share it with those of you interested and/or know Joel and Krista. Lord willing, we are organizing a fairly large mission trip down to Costa Rica in the early part of 2017. If you are interested, please get a hold of Grace Missions International or Grace Community Church, or I can take your information as well. Below is the update from Joel and Krista. Natural response is to justify, normalize or legalize my “behavior,” but the truth of the matter is everything wrong that flows out of me (behavior) is fueled (desires) by some form of idea or thought (belief). But where do all those ideas or thoughts come from? Answer: Matthew 15:19 (along with Gen. 6:5; Prov. 20:9, 21:2; and Jer. 17:9). WARNING: This is not a clever little outline to Krista and me. This is life and death and almost all of our counseling (and problems in our own lives) is a result of this cycle. If you are still reading this, we can’t thank you enough for your part in helping us proclaim the Gospel to the poor, the broken-hearted, the captives, those who are bound, “to proclaim the year of the LORD’s favor (lit. “grace”) to comfort all who mourn, giving them beautiful headdress instead of ashes, the oil of gladness instead of mourning, the garment of praise instead of a faint spirit… that He may be glorified” (Isaiah 61:1-3).